kids love this.more proteins in this ladoo. In 1 tbsp ghee,roast the soyabean flour till slight brownish(badami) colour. Mix powdered sugar,milk powder & cardamom powder with the soyabean flour.. In 1 tbsp ghee add cashew nuts.after it starts slight golden add raisins. Add remaining melted ghee.Mix thoroughly. Make lemon sized balls when warm. 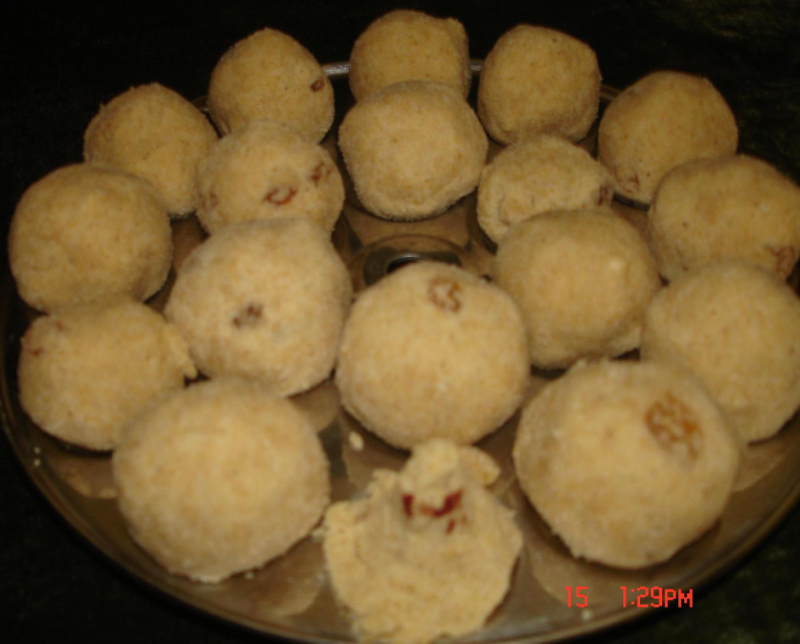 soyabean flour Ladoo is ready. hi rajeshwari, don't get upset .your recipe is nice and liked by everyone in my family.thanx once again don't be upset and keep on sharing such good recipes with us. waiting for your next recipe. Good job rajeswari your recipes are so tasty. dont be upset, Happy cooking! Dear Rajeshmeri & christy, I am really happy that u have been supportive & we all should be but just a small advice from me if u don't mind. when we put something forward to the public we must keep in mind that we will get some criticism & praising as we can't make everyone happy so we must be prepared for it whole heartedly as it will make us better in what ever task we do & if some people r being foolish then it should not bother us at all. U keep on posting ur nice recipes & don't let others bother u. I hope you don't mind my advice. Cheers. I am very upset to see such comments.i never voted for myself.I request admin team to list the voters names.if a person votes,his or her name should come alongwith it.please make changes like that.I wanted to share my recipes and i love cooking different states recipes.sometimes i vote but doesn't pass comment as i am satisfied with their preparation.sometimes i doesn't vote but try and tried some recipes.I thank Ms.Christy for these consoling words and a supportive friend. Coolcook,u must admit hacking into admin details. More over I still wonder how busy people like u get enough time to hack others. I'm sorry to say this but you should be ashamed for this (act of hacking others) more than u regret for others voting for their own recipes(which is less harmful). Moreover, finding fault with a genuine person like Rajeshwari should be deeply regretted by all here.We all know how many wonderful recipes she has submitted and u never appreciated that effort of her.Yes,We-all the account holders, do have one voting chance for our own-recipes(every recipe) - which is still allowed by the Khanakhazana Website and we are using it. If it is not allowed, then the admin team of khanakhazana must take efforts to restrict the own author's of recipes from voting for it (by disabling the vote tab when the author of the recipe opens in that account). More over many people share one PC/Laptop in many family but don't want their email id's to be revealed to others(because of the hacking people).So,they also use the same account of us, for ex. my account has been used for voting and recipe submission-under my supervision (never told my password to them) by my hubby,my in-laws and cousin many times.Coolcook,we like u submitting good recipes than finding fault with others or hacking others who do wonderful job in giving good recipes to many viewers of KK.Com. Dear Coolcook,i saw some more recipes in upcoming recipes and i voted for mutabaq and rabz and some more and rajeswari.i don't know whether rajeswari is aware that i voted for her. This recipe is nice but sorry to say this, are you voting for your own recipes all the time??? Since all 3 of your recipes are given one vote. & some people have 2- 3 votes yet their recipes are not published by KK.